Every piano teacher wants to see progress. With slow progress comes low motivation, with low motivation comes faltering retention and… with faltering retention that cruise you’ve been saving up for sails farther and farther into the distance! Every piano teacher’s job is to eventually make themselves not needed. Weird… I know! However, as a teacher your job is to give your piano students the long-term skills they need to be able to continue their learning long after they’ve bid you farewell. And so, every piano teacher should then include “Surprise Me Day” in their studio planning each month! What Is ‘Surprise Me Day’ And Why Does It Work? Surprise Me Day is a designated week every single month in your studio. 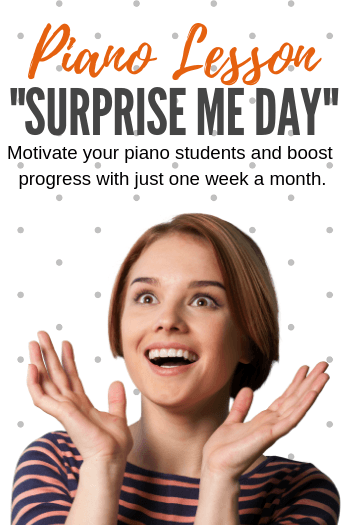 We call it Surprise Me Day as your piano students who come once a week will see it as just one day in the month, but to include all of your students you’ll likely need to designate a week. 1) Print off the list below of possible “surprises”. Clip it in your piano kids’ binders so it’s immediately available. 2) Make a big deal about Surprise Me Day each month. Post it on your blog or studio Facebook page, send home an email or newsletter, create a promo video… whatever it takes! 3) The week before Surprise Me Day remind your students that their task is to choose one possible surprise from the list and prepare it for their next piano lesson. 5) On Surprise Me Day you also have to surprise your piano students with something exciting in exchange for their newly learned skill. Ice Cream Sandwiches, popsicles, homemade cookies, a new and exciting game to play during their lesson… anything that will have them leave their lesson with a smile. Surprise Me Day works because your students are learning to take ownership over their own learning. They are learning to problem solve; to use their skill set to teach themselves how to work through an unfamiliar musical task. Students are enthused about showing off their abilities… and intrinsic motivation runs wild! There is truly nothing that makes a child feel better about themselves than well-deserved praise from an adult they admire. Here’s your opportunity to create that scenario for them! 1) Flip ahead 3 pages in your book and teach yourself to play the right hand of that piece. 2) Memorize a piece from 3 pages back in your book. 3) Play your current piece with all the dynamics, phrasing, articulation and expression in place… perfectly! 5) Flip ahead 1 page in your method book and teach yourself the first two lines hands together. 6) Research a composer and bring in three interesting facts to share with me. 7) Choose three different keys and memorize the pentascale, scale and triad for each one. 8) Create your own note-naming game for us to play at the next lesson. What’s my favorite “surprise me” item to add to the list above? “Teach yourself to play your TEDDtales exercises with plenty of expression and dynamics.” These engaging technical exercises come back every single time polished to perfection. Kids love them… teachers love them just as much! Check them out here. Do Your Piano Students Have an “Interesting” Taste in Music?